We do not know what the future holds for us; we are not able to see around the "bends" in the "road" before us - and there are bends. But, we do know God is faithful! We do know He loves us! We do know God always does what He says He will do and He knows what the future holds for us - He sees what is in the bends before us. We are able to fully trust Him! 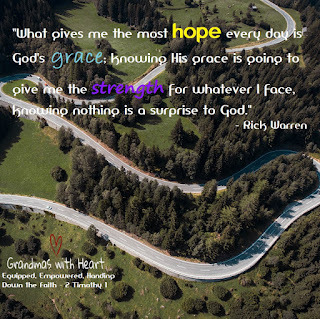 When our grandchildren see us trust God, live with hope and experience God's grace, they will live the same way and experience the strength trusting God will bring to their own lives.